In the technology era of today, there is a majority of people across the globe who are interested in buying high-end spec mobile phones at a competitive price. Recently, two popular mobile phone manufacturers known as Samsung and Xiaomi have released their new flagship phones “Samsung Galaxy Note 9” and “Xiaomi Pocophone F1”. Both the flagship mobiles comprise innovative specs and features. In this blog, I will be doing a detailed comparison of both these flagship mobile phones which will help you buy a high-end mobile phone at a reasonable price. The reason for writing this blog is that both of these flagship mobile phones comprise of similar specs and features. Price is considered one of the most significant factors when buying a mobile phone nowadays. When we compare both these flagship mobile phones prices, you get to know that Samsung Galaxy Note 9 price in Pakistan is Rs.1,29,000 whereas Xiaomi Pocophone F1 price in Pakistan is yet to be announced by the Xiaomi officials, but as per the fan-made expectations regarding this upcoming Xiaomi mobile price is that it will be around Rs.60,000. Here you can clearly see that Pocophone F1 beats Galaxy Note 9 in terms of price in Pakistan. Both these flagship mobile phones by Samsung and Xiaomi feature high-resolution displays with appealing color options. The design of both these phones is impressive and appealing. Samsung Galaxy Note 9 features a similar design language like its previous model Note 8 with a bit of amendment in the fingerprint sensor placement and cameras. When we talk about Pocophone F1 design, you see a glass front and plastic back, whereas the Samsung Note 9 features front and back of the glass with sides protected with an aluminum case. When we talk about colors of the screen, Pocophone F1 features IPS LCD capacitive touchscreen with 16M colors, whereas Note 9 features a Super AMOLED capacitive touchscreen with 16M colors. Note 9 features a screen size of 6.4-inches with a screen resolution of 1440x2960 pixels with 516ppi. The screen is protected with Corning Gorilla Glass 5. On the other hand, Xiaomi Pocophone F1 features 6.18-inch screen size with a screen resolution of 1080x2246 pixels with 403ppi. The screen of this upcoming mi phone is protected with Corning Gorilla Glass. Here you clearly see that Note 9 beats the screen size as well as a resolution of its rival Pocophone F1. You will surely be able to view more clear images on Note 9 as compared to Pocophone F1. Under the hood of Samsung Note 9, you get to see 2.7 GHz Exynos 9810 Octa-core Qualcomm SDM845 Snapdragon processor which is coupled with 6/8GB RAM. It will be coming with two internal storage capacities which are 128GB and 512GB, which the user can also expand up to 512 GB via microSD card. On the other hand, under the hood of Xiaomi Pocophone F1, you see a 2.8GHz Octa-core Qualcomm SDM845 Snapdragon processor which is coupled with 6/8GB RAM. It will be coming in three different internal storage capacities which are 64/128/256GB, which the user can also expand up to 256GB via microSD card. When we talk about GPU, Note 9 and Pocophone F1 both are powered with Adreno 630. Both the flagship mobile phones of Samsung and Xiaomi are running on Android latest operating system called Oreo v8.1, which helps both phones to perform multitasking in an effortless manner. Nowadays, cameras in the smartphone are considered as one of the most significant factors among the consumers who wish to buy a new mobile phone. You will be glad to know that both these phones are equipped with spectacular cameras. Samsung Galaxy Note 9 is featuring a dual 12+12MP rear camera with dual pixel PDAF, autofocus and LED flash, whereas at the front you get to see an 8MP front selfie shooter with autofocus. The front camera also supports dual video call. Now let us talk about Xiaomi Pocophone F1 cameras, it will be featuring a dual 12+5MP rear camera with dual pixel PDAF and dual LED flash, whereas at the front you get to see a 20MP front selfie shooter. Both the cameras have the capability to record and shoot pictures in high definition quality. The battery is another significant feature which is considered when buying a new mobile phone nowadays. Galaxy Note 9 and Xiaomi Pocophone F1 are powered with 4000mAH non-removable Li Po battery. This powerful battery helps both these phones to give a standby time of 2-3 days depending on the usage of the users. Xiaomi Pocophone F1 is available in four appealing colors which include Graphite Black, Armored Edition with Kevlar, Steel Blue and Rosso Red. 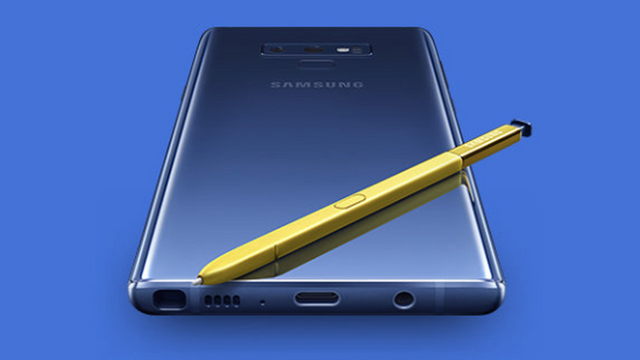 Note 9 is also available in four appealing colors which include Ocean Blue, Lavender Purple, Midnight Black and Metallic Copper. Samsung Note 9 comes with an Iris scanner, rear-mounted fingerprint sensor for security, barometer, SpO2, Samsung Dex support and heart rate are the innovative features which are available in this Samsung flagship mobile phone. Xiaomi Pocophone F1 comes with infrared face recognition, a fingerprint at the rear, barometer, compass, proximity, gyro and accelerometer. After doing a detailed comparison of both these flagship phones of Samsung and Xiaomi phones, I came to decision that if you are planning to buy a high-end mobile phone at a competitive price, you certainly can go with Xiaomi Pocophone F1. If the price is no issue for you, then you certainly should go for Samsung Note 9 as the only difference between these two phones is their screen resolution and price.